It's probably fair to say that the state is increasingly taking the role of God unto itself. From Egyptian pharaohs to European kings, rulers have long claimed that that they had a divine right to rule over their subjects. Ever since the Age of Enlightenment, the prevailing principle has been the separation of church and state. But Enlightenment thinkers failed to predict the state taking the role of God. Nationalism and patriotism have become a religion of sorts. States, under the guidance of the global elite, yearn to be the "all powerful". They put their citizens under constant surveillance, in an attemp to be the "all knowing". Adding law after law, regulation after regulation, the state interferes in every aspect of peoples lives. The state might strive to be omniscient, omnipotent and omnipresent, but it will never be omnibenevolent or even simply benovelent - not until it stops serving an oligarchy. 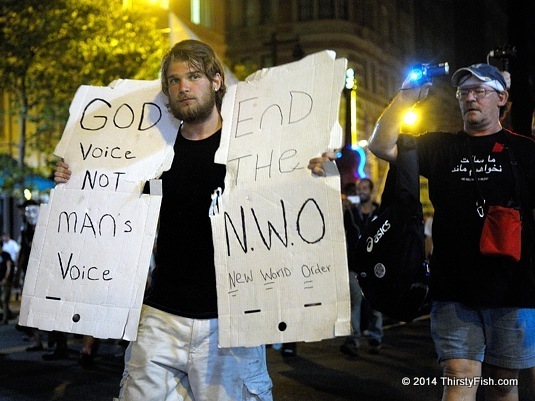 The state is not God; It's just some men's voices.